Buffalo Chicken Jalapeno Poppers was another recipe picked by our judges. The tasters really enjoyed this one. Personally, I think most things are better if they are wrapped in bacon. 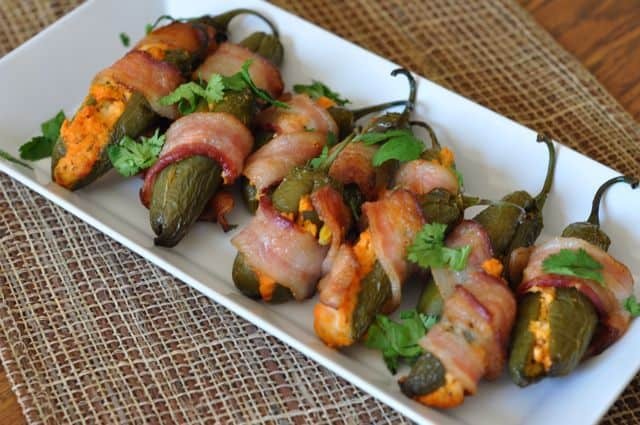 Here we have wrapped jalapeno poppers in bacon. I modified Tom’s recipe a bit. He mentions you should use a really nice jalapeno grilling pan. I don’t have one, as I am sure most of you don’t have one. So I improvised. I skewered my prepared jalapenos on a long metallic skewer and then I baked these in the oven. This worked really well. I have a couple of tips, I think this recipe could easily fill about 36 jalapeno peppers. I would also suggest that you pick jalapenos that are of the same size. 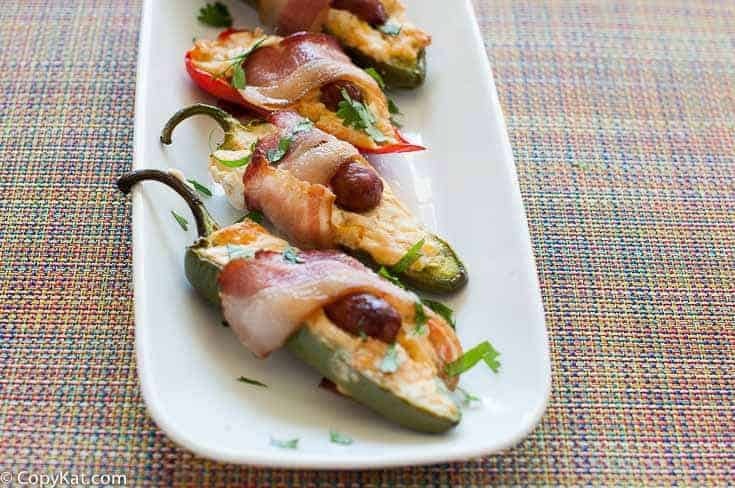 Jalapeno poppers are stuffed with buffalo chicken and little smokies before they are wrapped with bacon. In a bowl combine the first six ingredients and mix well. Remove the tops of the jalapenos and remove the seeds using a corer. Place jalapenos in the rack. Add half the chicken mixture into a zip top plastic bag and cut a small hole in the corner. Using zip top bag as a pastry bag squeeze chicken mixture into each jalapeno. Wrap each jalapeno with 1/2 strip of bacon and secure with a toothpick. Place the rack of peppers on the grill and cook at 350 degrees for 20 to 25 minutes. Check the internal temperature of the chicken with an instant read thermometer, it should read 165 degrees. Remove from grill and allow to cool.Serve with blue cheese or ranch dressing for dipping. If you do not have a jalapeno grilling tool, you can simply slide the jalapeno by slicing it on one side. If you do not like your peppers too hot, you can remove the seeds. Removing the seeds from the peppers will help remove some of the heat. Spoon in about 1 to 2 teaspoons of the chicken mixture in the pepper. Wrap it closed by wrapping the bacon around the pepper. Pierce the bacon wrapped jalapeno pepper onto the metal skewer, each skewer can hold several peppers. Lay the skewers over a 9 x 13 inch baking dish. This will have the peppers upright, and all of the bacon grease will drip away from the pepper. I like your modifications Stephanie, you are right, not everyone has a jalapeno grilling rack. Glad you liked the recipe, my neighbor sure did. Loving the idea of these. They would make fabulous Superbowl snacks!! !